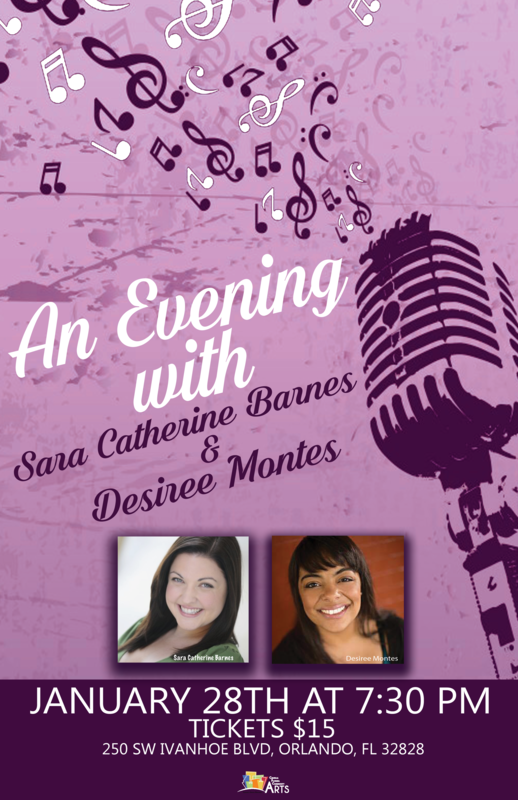 Local favorites Sara Catherine Barnes and Desiree Montes join forces for one night only, performing music from Broadway and beyond. Sara Catherine Barnes has appeared in theatrical productions throughout Central Florida, including acclaimed roles as ‘Maria’ in The Sound of Music and ‘the Baker’s Wife’ in Into the Woods, both at CFCArts Theatre. Desiree Montes played ‘The Witch’ in that same production of Into the Woods, and was recently featured in the Orlando Sentinel’s ‘Best of 2016′ for her performance in TheatreWorks’ Production of Hands on a Hardbody. Together, these two women will show a special audience what makes them so beloved in our community. On January 28th at 7:30 pm at the CFCArts Blackbox Theatre, located at Central Florida Community Arts 250 SW Ivanhoe Blvd, Orlando, FL 32804.